The apterae of Neomyzus circumflexus (previously known as Aulacorthum circumflexum) are shiny whitish, yellowish or green with black cross bands on thoracic segments, broken along the midline, and a large horseshoe-shaped spot on the back of the abdomen (see first picture below). Antennal tubercles are well developed with the inner faces parallel. The antennae are 1.1-1.5 times the body length and the antennal terminal process is approximately 5-6 times length of base of antennal segment VI. The siphunculi are dusky with a darker flange. They are rather thick and cylindrical and are 1.8-2.3 times the length of the cauda. The cauda is pale, elongate with 4-6 lateral hairs and a single dorsal preapical hair. The body length of Neomyzus circumflexus apterae is 1.2-2.6 mm. Image of alate copyright Nigel Gilligan, all rights reserved. The alate is pale green with a black head and thorax (see second picture above). The abdomen has several dark transverse bands of variable width. The clarified slide mounts below are of adult viviparous female Neomyzus circumflexus (= Aulacorthum circumflexum) : wingless, and winged. Guest image(s) by permission of Roger Blackman copyright AWP all rights reserved. 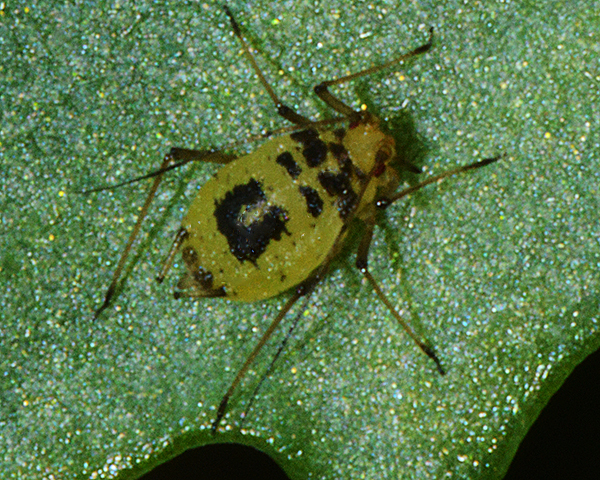 The crescent-marked lily aphid is entirely parthenogenetic with no sexual stage in the life cycle. In temperate climates it is primarily a pest of glasshouse crops where it attacks Asparagus, Begonia, Fuchsia and many others. Heavy infestations cause direct harm to many ornamental plants, and the aphids may also transmit viruses. Neomyzus circumflexus has a cosmopolitan distribution. 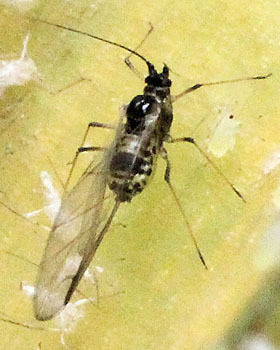 The black markings of the adult crescent-marked lily aphid can be highly variable to the extent that the large horseshoe-shaped spot on the back of the abdomen is filled in and no longer discernible as a U-shape. The black cross bands on the thoracic segments, normally broken along the midline, may be continuous and may extend out to the edge of the dorsum. The pictures below show (first) a lightly marked form and (second) a more heavily marked form. The background colour also varies from whitish to yellow, orange, or green. Immature Neomyzus circumflexus are usually the same background colour as their parents, but they lack the characteristic black markings and as such can be readily confused with immatures of other species such as Myzus ornatus. 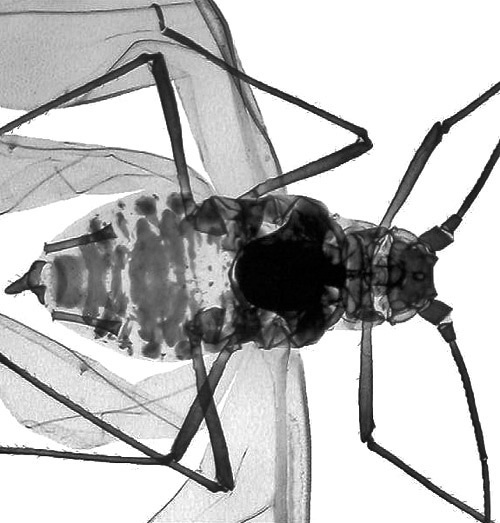 The picture above shows some recently deposited nymphs near the parthenogenetic adult. Borges et al. (2006) looked at the spatial distribution of a number of aphid species including Neomyzus circumflexus for comparison with coccid species. 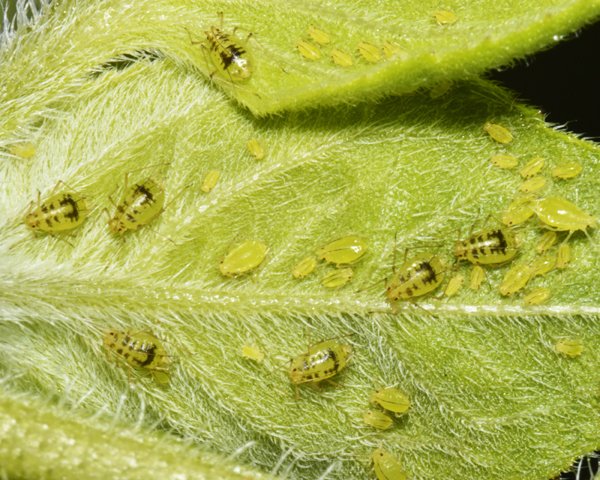 However, all aphid species were pooled together, so we can only note the general conclusion that aphids were aggregated into colonies, but the colonies were randomly distributed. They did show that Neomyzus circumflexus had the smallest 'colony size' of any of the aphid species they had in their study. Our impression is that rather small, fairly discrete colonies develop where deposited by the vivipara, which then moves a few centimetres to a different site before depositing another 5-10 aphids. 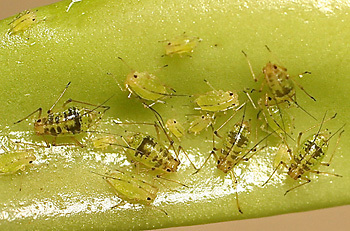 Over time these aphids can virtually cover the leaf. Yovkova et al. (1997) looked at the species composition and host range of aphids on ornamental greenhouse plants in Bulgaria. Neomyzus circumflexus was present on 23 different host species, the third widest host range after Myzus persicae and Aulacorthum solani. We have also found Neomyzus circumflexus on a wide range of hosts, especially in greenhouses. 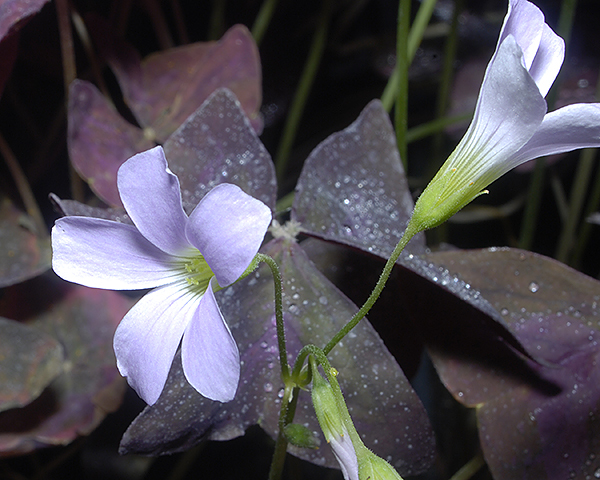 Ornamental wood-sorrels (Oxalis spp.) seem to be especially favoured as hosts (see two pictures below), and we have found it on both Oxalis corniculata and Oxalis stricta. We have also found it on fig (Ficus carica) and sage (Salvia pratensis) (see picture below of aphids on sage). The species is by no means restricted to greenhouses, and we have found it 'in the wild' on nipplewort (Lapsana communis), common sowthistle (Sonchus oleraceus) and buttercups (Ranunculus), mostly in spring time (April-June). 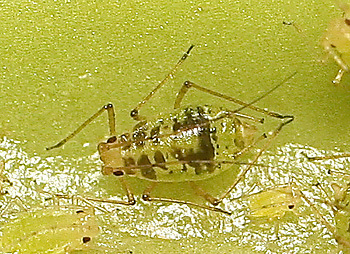 A common feature of Neomyzus circumflexus is that it forms mixed species colonies with other aphid species. 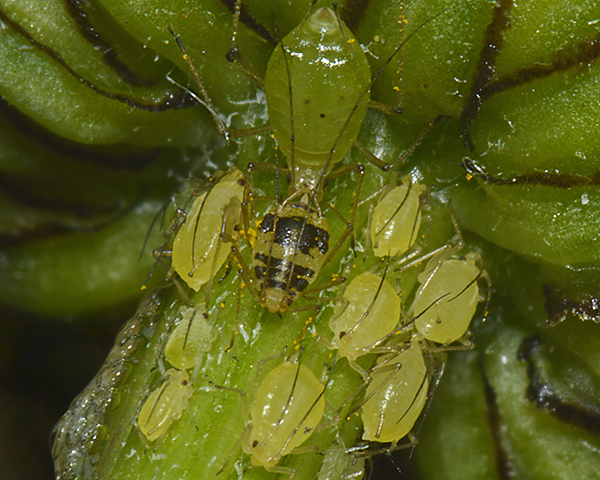 The picture below shows a single adult of Neomyzus circumflexus with several of its rapidly maturing offspring (the pale yellow aphids) along with a larger aphid, the similarly polyphagous potato aphid (Macrosiphum euphorbiae) on the flower stem of an ox-eye daisy. Different species often form mixed species colony to benefit from the sink effects whereby photoassimilates are concentrated at the feeding site (Peel & Ho (1970). This sink effect increases with colony size. Neomyzus circumflexus has been recorded on 3 Lilium species (Lilium lancifolium, Lilium longiflorum, Lilium washingtonianum). 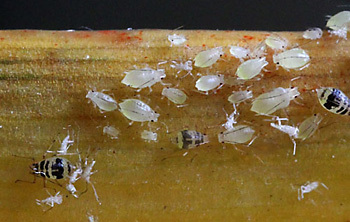 Blackman & Eastop list 19 species of aphid as feeding on lily (Lilium species) worldwide, and provide formal identification keys. Of those aphid species, Baker (2015) lists 10 as occurring in Britain: Aphis fabae, Aphis gossypii, Aulacorthum solani, Dysaphis tulipae, Macrosiphum euphorbiae, Myzus ascalonicus Myzus ornatus, Myzus persicae Neomyzus circumflexus = Aulacorthum circumflexum and Rhopalosiphoninus staphyleae. Blackman & Eastop list 10 species of aphid as feeding on Arum species worldwide, and provide formal identification keys. Of those aphid species, Baker (2015) lists 8 as occurring in Britain: Aphis gossypii, Aulacorthum solani, Dysaphis tulipae, Macrosiphum euphorbiae, Myzus cymbalariae, Myzus persicae, Neomyzus circumflexus and Patchiella reamuri. Neomyzus circumflexus has been recorded on 4 Oxalis species (Oxalis articulata, Oxalis corniculata, Oxalis deppei, Oxalis rosea). Blackman & Eastop list 21 species of aphid as feeding on wood sorrels (Oxalis species) worldwide, and provide formal identification keys. 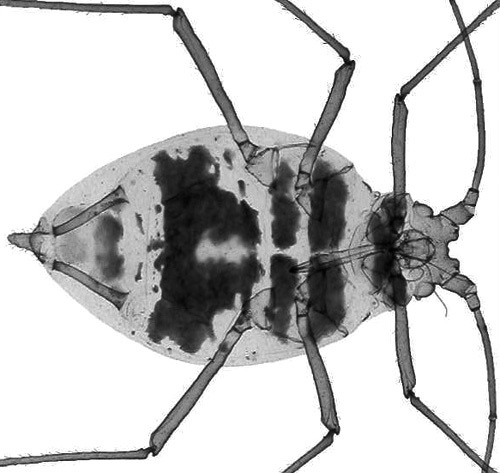 Of those aphid species, Baker (2015) lists 17 as occurring in Britain: Aphis aurantii, Aphis craccivora, Aphis fabae, Aphis gossypii, Aphis nasturtii, Aphis solanella, Aphis spiraecola, Aulacorthum solani, Brachycaudus helichrysi, Macrosiphum euphorbiae, Myzus ascalonicus Myzus cymbalariae. Myzus ornatus, Myzus persicae Neomyzus circumflexus, Rhopalosiphoninus latysiphon and Rhopalosiphoninus staphyleae. Neomyzus circumflexus has been recorded on 2 Sonchus species: Sonchus oleraceus and Sonchus asper. Blackman & Eastop list 36 species of aphid as feeding on common sowthistle (Sonchus oleraceus) worldwide, and provide formal identification keys. Of those aphid species, Baker (2015) lists 24 as occurring in Britain: Acyrthosiphon lactucae, Aphis craccivora, Aphis fabae, Aphis gossypii, Aphis nerii, Aphis solanella, Aphis spiraecola, Aulacorthum solani, Hyperomyzus lactucae, Hyperomyzus pallidus, Macrosiphum euphorbiae, Myzus ornatus, Myzus persicae, Nasonovia ribisnigri, Neomyzus circumflexus, Pemphigus bursarius, Protaphis terricola, Protrama flavescens, Trama caudata, Trama maritima, Trama troglodytes, Uroleucon cichorii and Uroleucon sonchi. Neomyzus circumflexus has been recorded on 4 Ranunculus species (Ranunculus acris, Ranunculus bulbosus, Ranunculus recurvatus, Ranunculus sundaicus) on which Blackman & Eastop list 18 species of aphid on them worldwide, and provide formal identification keys for Ranunculus species. Miller & Stoetzel (1997) note that Neomyzus circumflexus is one of 15 species of aphids known to colonize cultivated and wild chrysanthemums in the United States. Large colonies of aphids can greatly reduce plant vigour and kill the plant through mechanical injury. However, even a few feeding aphids can damage plants because they produce a sticky substance called honeydew. In the higher humidity of a greenhouse, honeydew provides an excellent substrate for the growth of black sooty mould. Large areas of mould covering the leaves can reduce photosynthesis and also result in an unattractive plant with a much lower market value. Additionally, some species of aphids can transmit several viral diseases that injure chrysanthemums although Neomyzus circumflexus is not a known vector of the chrysanthemum viruses. Alford (2012) lists a number of greenhouse ornamentals on which Neomyzus circumflexus can become abundant in addition to those previously mentioned, including lilies (Lilium), cyclamen, Petunia, primrose (Primula vulgaris) and tulip (Tulipa) as well as various orchids and ferns. Aside from causing direct feeding damage, and growth of sooty moulds, Neomyzus circumflexus can transmit some plant viruses including dahlia mosaic virus, primula mosaic virus and tulip breaking virus. 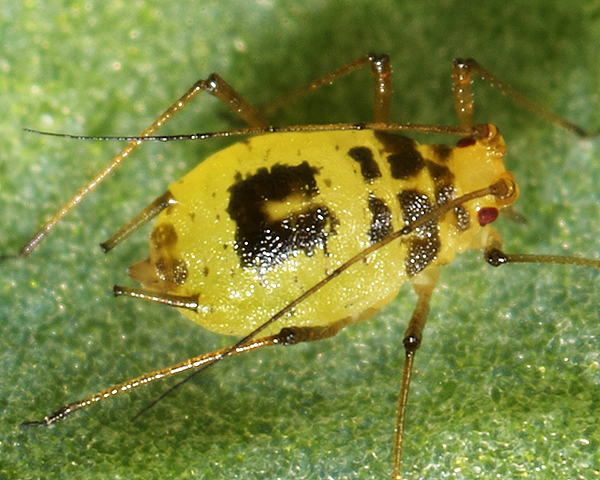 Most greenhouse pests are best controlled by integrated pest management, and the crescent-marked lily aphid is no exception. Dassonville et al. (2012) reported how a Belgian company (Viridaxis) developed a new concept of aphid control, based not on the pest-species identified but upon the crop treated. To protect vegetables against their main aphids, VerdaProtect contains six different species of natural aphid enemies. When used preventively, it was able to control all commonly appearing aphids attacking vegetable crops. 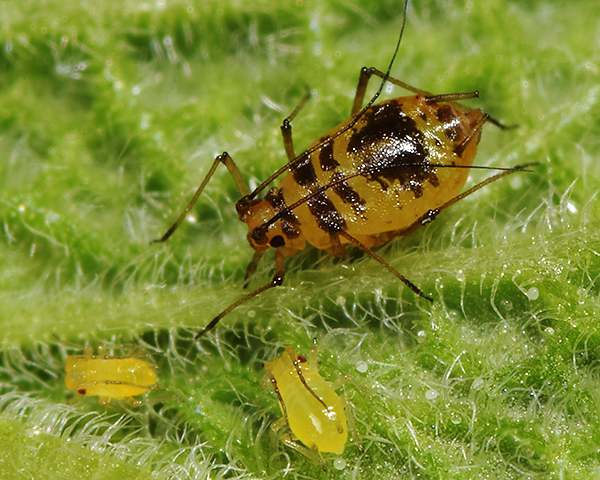 One of the aphid species covered by the system is Neomyzus circumflexus which is attacked and controlled by Aphidius ervi (at very high efficacy) and by Aphelinus abdominalis, Ephedrus cerasicola and Praon volucre (at high efficacy). The integrated pest management strategy against aphids formerly used by this company was 'banker plants' - hosting non-pest aphids infested with aphid enemies. 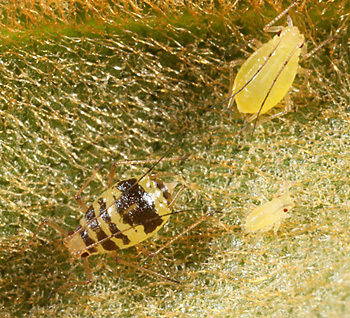 With this former strategy, the control of aphids generally failed in June-July due to the abundance of hyperparasitoids preying upon the aphid enemies. The use of a parasite mix prevented the build up of hyperparasitoids. We especially thank Plumpton College and Plumpton College at Stanmer Park for their kind assistance, and permission to sample. Our particular thanks to Roger Blackman for images of his clarified slide mounts, and to Nigel Gilligan for his image of an alate Neomyzus circumflexus. Alford, D.V. (2012). Pests of ornamental trees, shrubs and flowers: A colour handbook. CRC Press. From the site today, King George V Memorial Walk [in Cornwall], was an aphid found on Magnolia grandiflora. The host list suggests Aphis magnoliae, but from there I'm stumped. The aphids were on a very soft new leaf, not many of them at all and only on one leaf. I also inspected other Magnolia grandiflora, as far as I could, at the site and didn't find any more. I'm sure if you've see it you'll recognise it. False alarm, I knew I'd seen it before, have just found the aphid on Magnolia grandiflora, it's Aulacorthum circumflexum. Aulacorthum circumflexum does seem to like occurring on exotics with few other aphid species locally. They can be a bit difficult to identify if there's no adult! Yes I bet they can. Adults very striking indeed. 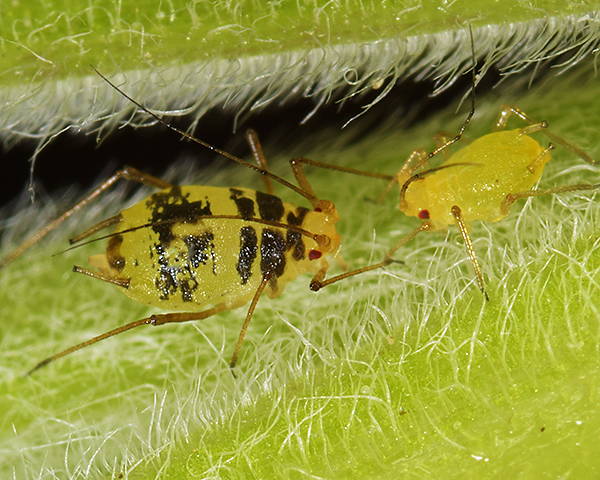 On one of my orchid plants in our greenhouse the other day I found a number of aphids (two images below) that I believe are probably Aulacorthum circumflexum. Some of these are now in alcohol in case they need checking! Images copyright Alan Outen, all rights reserved. 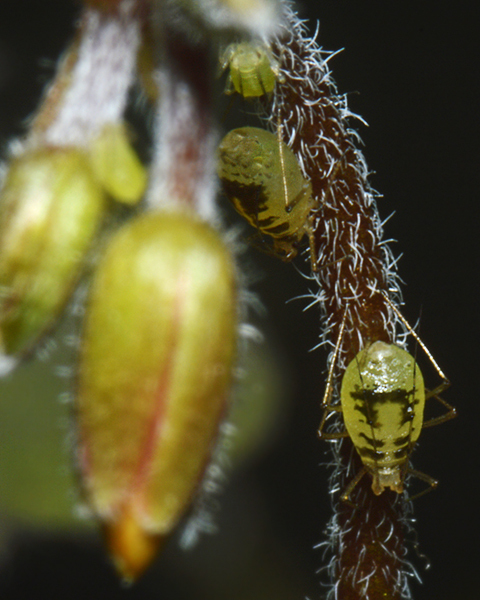 Yes, the aphids on the orchid most certainly look like Aulacorthum circumflexum - a wonderfully distinctive aphid once it gets to the adult stage, but tricky as a nymph. We've found it on all sorts of greenhouse plants. I have had a trawl through the basic genera, and the only things that look a bit like this are some of the Drepanosiphum sp. But the ones shown don't have this broad black plate across the middle the middle of the abdomen. My photos show a group of them, immatures, less immature maybe, and a winged adult. The latter looks like it has a massive cauda like a horntail's ovipositor, or am I misinterpreting it. I have other photos that are less clear, the wings obscuring the view, but similar appearance. They are very small, so had to check them initially with a x30 hand lens. I reckon the larger ones have a body about 1.5 mm long. The aphids are curiously only on the leaf that is dying, whilst the other leaves have almost none on them. Or is this cause and effect? Image(s) copyright Nigel Gilligan, all rights reserved. 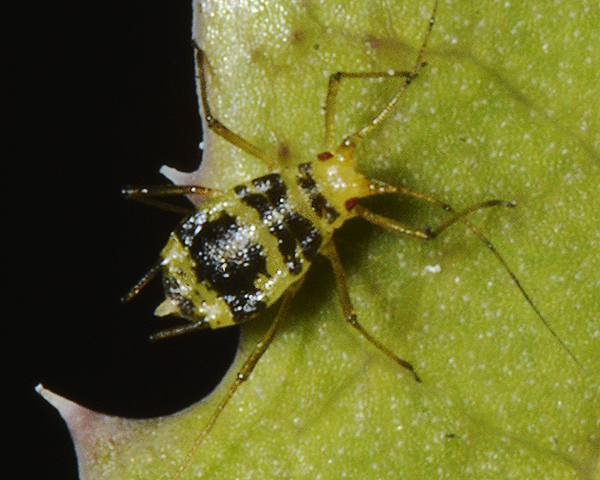 The aphids are Aulacorthum circumflexum. Beware, there are lots of synonyms, like Neomyzus circumflexus. 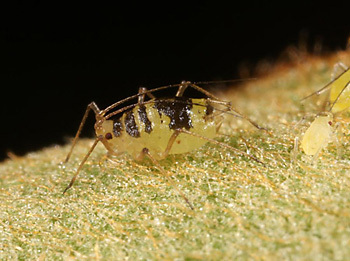 The fact that the leaf is dying may be partly because of the aphids, but aphids often like senescing leaves because the plant is retrieving its nutrients - which, as a result, are more available to the aphids. What you are seeing as an "ovipositor" is actually the costa of the wing - which happens to be lying across that insect. Thanks very much for pointing me in the right direction. I should probably have found that one. And thanks for solving the interpretation/visual problem I had. Silly really!